One of my all time favorite salads is Chinese Chicken Salads. There is something about the crunchy vegetables, the sweet mandarin oranges and the tangy Asian dressing that just gets me sooooo excited. 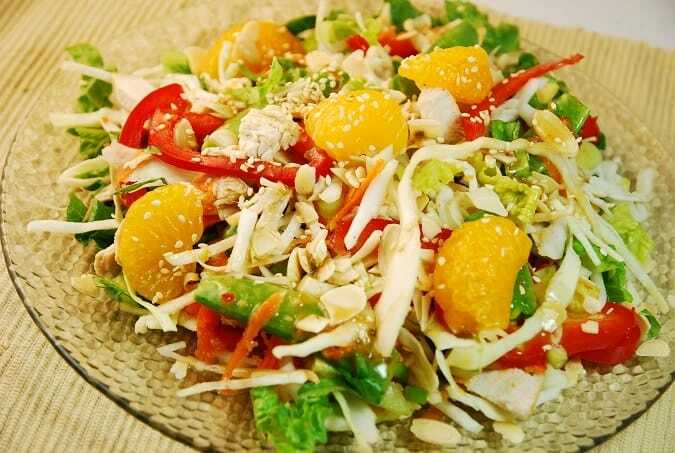 But, even though it is a salad, a traditional Chinese Chicken Salad is actually pretty high in calories. My lighter version makes a few healthier changes and tastes fantastic! The cabbage and toasted almond slices give it that perfect crunch, and the juicy mandarins add a delightfully sweet, yet tart, flavor. The light dressing still packs a ton of flavor, but also saves a lot of fat and calories. Pair my Weight Watchers Chinese Chicken Salad with your favorite soup for a complete meal that won’t break the Points bank. Enjoy! Fresh, crunchy and delicious, this Weight Watchers Chinese Chicken Salad Recipe makes an excellent lunch idea! It’s flavorful and satisfying. Combine all ingredients in a bowl except almond slices, mandarin oranges, and sesame seeds. Toss well. Divide equally into 4 serving bowls or plates. Top each serving equally with oranges, almond slices, and sesame seeds, and serve.